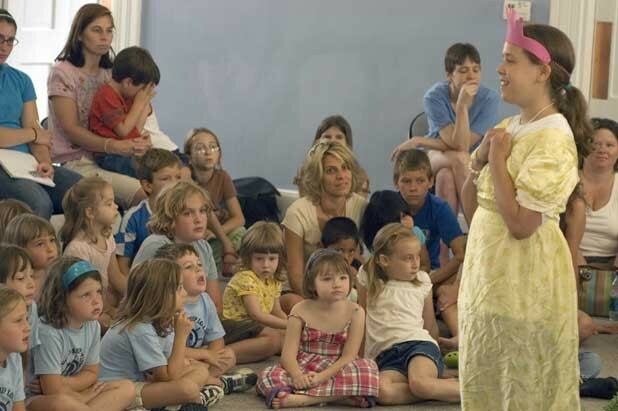 Scene@ Island Road Theater's "Sleeping Beauty" And "The Hat"
Colchester Meeting House, Thursday, July 17, 10:30 A.M.
As a full-time babysitter this summer, I'm always looking for events to shake up the daily routine. This week's treat came in the form of Island Road Theater's "Sleeping Beauty" and "The Hat." The 3-year-old theater group is composed of 14 actors ranging from third- to eighth-graders. Island Road's performance at the Colchester Meeting House, filled with parents in chairs and children scattered across a rug, was one of seven on a summer tour. The group's first play was quick and cute: "The Hat," adapted from a Jan Brett children's book about a hedgehog whose mistake of wearing laundry soon becomes a trend. But it was the second production, "Sleeping Beauty," that I liked most. Although a different take on the Disney film I'd remembered (Princess Aurora played football? ), for the most part the story was faithful to tradition. You had the evil woman, the spindle, a deep sleep, Prince Charming, the kiss, the awakening (cue the joyful gasp of the little girls sitting in front of me), and happily ever after. All this was followed by an autograph session, much to the delight of the audience. Director Ernie Hemingway, who also adapted these beloved stories into play form, said that her goal with his year's mostly new cast members was to familiarize them with performing for an audience. By starting with simpler shows such as "The Hat," she hopes to build confidence in the the young thespians and foster a passion for theater. "I want them to have a feeling of success, and so when they're older they go with more complicated scripts," Hemingway said. While impressed parents peppered the director with praise, I turned to my two charges for their take. What did they like most? Caitlin, 4, concluded she "liked all the girls," while Aidan, 7, focused a bit more on the overall content and execution. "They were both pretty good and funny," he said. I agreed. So it seemed that everyone - parents, kids and at least one babysitter - were as happy with the outcome as Prince Charming and Sleeping Beauty.